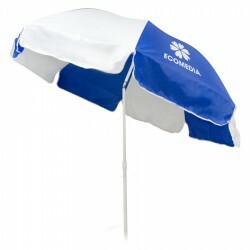 Businesses looking to expand their real estate should consider these promotional market umbrellas. They are perfect for streets, sidewalks and even beaches in any weather or season, making them really smart investments with real value. 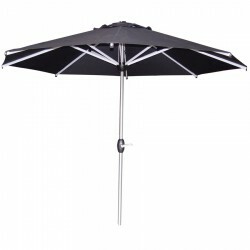 Choose from our collection here at Promotional Product Experts which showcases printed market umbrellas in a variety of styles, colours and sizes. 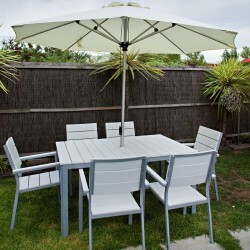 You can also choose from different materials such as hardwood, aluminium and stainless steel. Check out the images below for more information. A robust cost effective solution for home and light commerical use. Durable Meranti hardwood frame, two section pole with metal anodised connectors and pulley system. Acrylic canvas canopy. Indonesian A-grade hardwood, solid brass fittings, leather rib protectors and solid brass "L" clamps for cover longevity. Through the pole double pulley system for easier operation. Acrylic canvas. 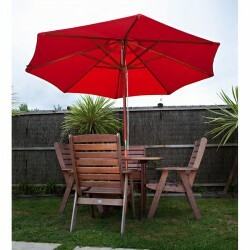 Our biggest selling umbrella, perfect for cafes and bars. 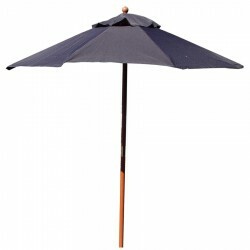 Matt aluminium finish with contrasting black fittings, double pulley with marine style loaded cleat, lightweight, single pole and component constructions with Special Spun Polyester fabric canopy. .
Our most popular wood umbrella. A robust cost effective solution for home and light commerical use. Indonesian quality hardwood, two section pole with metal anodised connectors and pully system. Acrylic canvas canopy. The frame is made up of Meranti hardwood, has a two-section pole with metal anodised connectors and a pulley system. 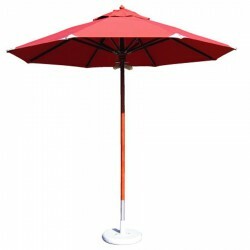 With Spec Spun polyester fabric canopy . The Fijian umbrella uses the cover to give it a tropical look. Indonesian quality hardwood, two section pole and Pulley System. 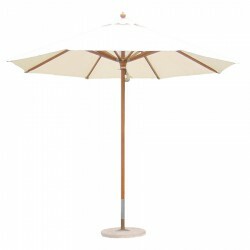 This oriental styled umbrella is a great accessory to any modern outdoor setting. 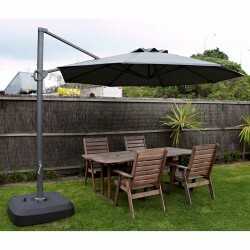 It has an aluminium main pole and 24 steel ribs plus crank and tilt features. With Polyester fabric. The frame is made up of Meranti hardwood, has a two section pole with metal anodised connectors and a pulley system. With Spun polyester fabric. Indonesian quality hardwood, two section pole with metal anodised connectors, pulley system, solid brass 'L' clamps to secure the cover. Spunpoly cover. A robust cost effective solution for home and light commerical use. 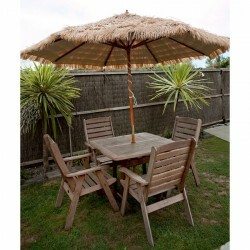 Meranti hardwood frame, two section pole with metal anodised connectors and pulley system, with a spun polyester canopy. A robust cost effective solution for home and light commerical use. 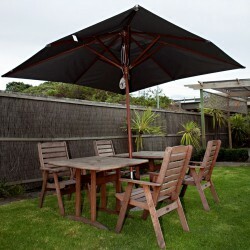 Meranti hardwood frame, two section pole with metal anodised connectors and pulley systems, with a spun polyester canopy. A robust cost-effective solution for home and light commerical use. Durable Meranti hardwood frame, two section pole with metal anodised connectors and a pulley system. Acrylic canvas canopy. 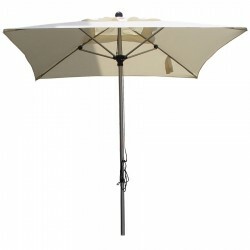 Our best selling umbrella. Lightweight and extra strong. 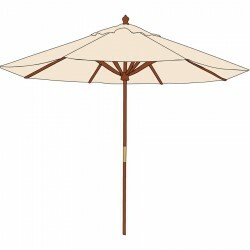 Great for outdoor use in bars, cafes, and near the sea (no rusting)! Full aluminium frame, double pulley with marine style spring loaded cleat, single section pole and component construction. 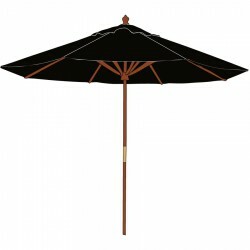 Acrylic canvas canopy. .
Our biggest selling umbrella, perfect for cafes and bars. Matt aluminium finish with contrasting black fittings, double pulley with marine style loaded cleat, lightweight, single pole and component constructions. 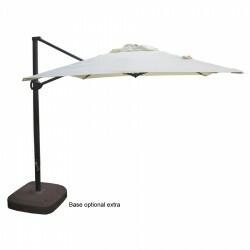 Polyester fabric canopy. It has taken us 3 years to find a cantilever that we are proud to put our name to and this is it! It tilts, swivels and folds away. 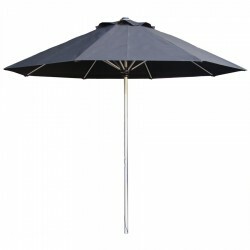 With an aluminium frame and acrylic canvas canopy. Size 2.5m square, stand included but paving slabs not supplied. This umbrella has it all. The latest design and modern technology combined, automatic open and close, solar panel on top to recharge battery, complete with remote control and built in LED lights for night time use. Polyester canopy. . The best of the best in our aluminium range. All aluminium frame and ribs with black wood runner, single one section pole, double pulley system for effortless opening and leather rib protectors. Polyester canopy. 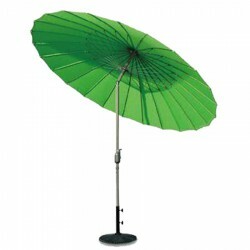 The ideal umbrella for the budget minded. Quality Chinese hardwood frame and two section pole with metal anodised connectors. Pulley system. 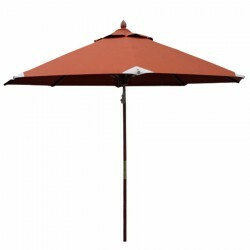 Spun polyester fabric canopy. The ideal umbrella for the budget minded. Quality Chinese hardwood and two section pole with metal anodised connectors. Pulley system. 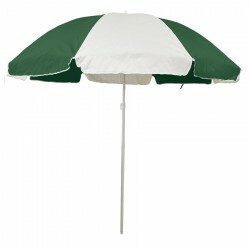 Spun polyester canopy. The best of the best in our aluminium range. All aluminium frame and ribs with black wood runner, single one section pole, double pulley system for effortless opening and leather rib protectors. 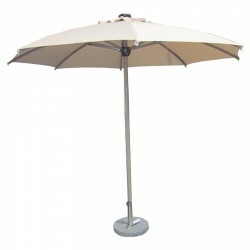 Acrylic canvas canopy. .
Indonesian A-grade hardwood frame, single one section pole, leather rib protectors, stainless steel rib connectors and rivets, leather rope holder, aluminium pole protection against the metal base. Double pulley system for effortless opening. Acrylic canvas. . 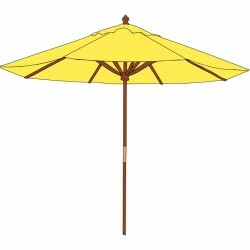 This umbrella has many features. It has a 1.8m diameter, folds down to 70cm in length, 3 section pole with tilt, Oxford polyester cover (90% sun block) and comes with a carry bag. Move up to lighter weight and stronger sluminium construction. 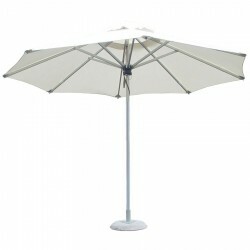 A powder-coated aluminium frame with polyester canopy and tilt feature.